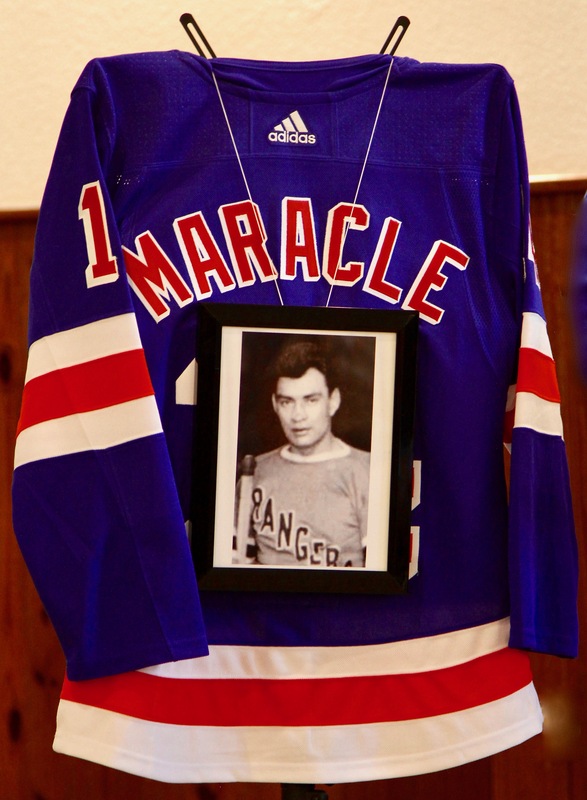 Once A Ranger: A photo of Buddy Maracle as he appeared during his 1931 stint with the New York Rangers adorns a sweater donated by the modern-day Rangers at the Queen Elizabeth Arena in Maracle’s hometown of Ayr, Ontario, during the June 13 ceremony. Buddy Maracle played just 11 games in the NHL, in 1931, and when his time on the left wing with the New York Rangers came to an end that season, the memory of what he’d achieved was quick to fade. Maracle, who was Mohawk, seems to have been the first Indigenous player to have skated in the NHL. But while historians have long recognized this distinction, including many belonging to the Society for International Hockey Research (SIHR), the news hasn’t exactly resonated in the wider world. The NHL itself doesn’t acknowledge Maracle and what he achieved — the history as the league has it is that Cree center Fred Sasakamoose was the original Indigenous player when he skated out for the Chicago Black Hawks in 1953-54. It’s no disrespect to Sasakamoose, 84, to point out this discrepancy, and doesn’t diminish his achievements, which were deservedly recognized last month when Governor-General Julie Payette made him a member of the Order of Canada. Mostly known in his hockey-playing days as “Buddy,” Maracle appears to have been already well and truly forgotten in 1953 when Sasakamoose made his debut, and the forgetting just continued on from there. Maracle wasn’t alone in fading into near-oblivion — a second Indigenous Ranger, defenceman Jim Jamieson, also preceded Sasakamoose on NHL ice, playing a single NHL game in 1944. His background was Cayuga, from Six Nations First Nation in southwestern Ontario. Sixty years after his death in 1958, Maracle is now gaining some measure of the recognition he’s due. Much of that is thanks to the efforts of Irene Schmidt-Adeney, a journalist in Ayr, Ontario, the small town, south of Kitchener, where Maracle was born in 1904. Her research into Maracle’s story resulted in a series of articles this spring in The Ayr News, the newspaper where she’s a reporter. Earlier this month, she also organized a poignant community ceremony in Maracle’s honour that was attended by members of his family along with an array of local politicians and hockey luminaries. On a night that also featured a concert by the 40-piece Ayr-Paris Band, Schmidt-Adeney began by sketching out the story of the journey that took Maracle from this small southwestern Ontario town of 4,000 to hockey’s heights. 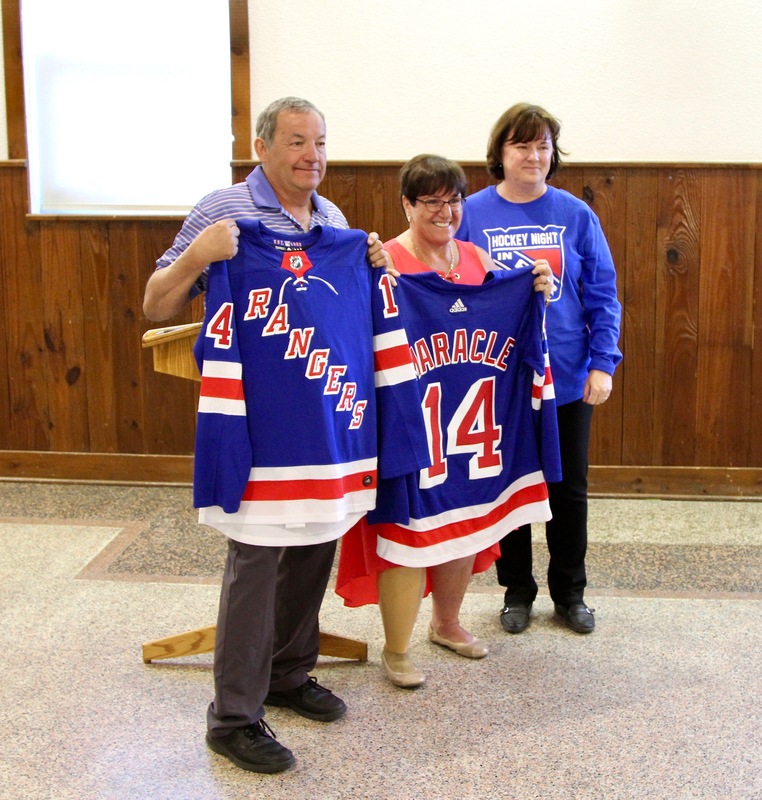 She finished up by presenting two latter-day New York Rangers sweaters emblazoned with Maracle’s name and number (14). One went to Sue Foxton, mayor of the Township of North Dumfries, in which Ayr is situated. The second was presented to Terry General, a councillor from the Six Nations of the Grand River, which lies some 50 kilometres to the southeast. The Rangers, at least, appear to acknowledge Maracle’s achievement: at Schmidt-Adeney’s request, the team donated the sweaters. It was a Globe and Mail obituary in February that started Schmidt-Adeney’s campaign leading up to the June 13 event. 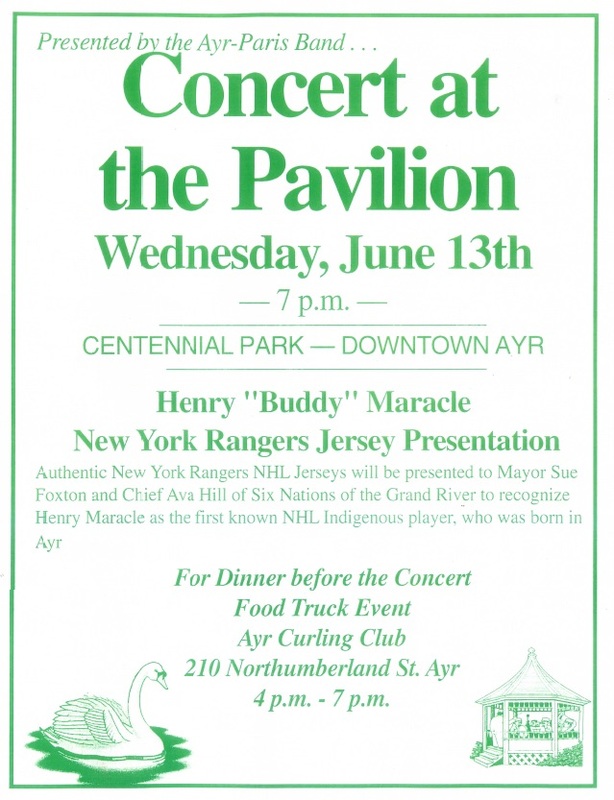 A reader of hers saw a mention of Maracle’s Ayr connection in Tom Hawthorn’s remembrance of hockey player Art Dorrington. Intrigued, she did what reporters do, and started digging. Her inquiries took her to the Six Nations Woodland Cultural Centre in Brantford, and it was there that she was able to trace the histories of Maracle’s parents, Albert and Elsie, both of whom were Mohawk from Six Nations. They were living in Blenheim Township, near Ayr, when Henry Elmer Maracle was born on September 8, 1904. Albert was a farm worker, and Schmidt-Adeney’s research points to the possibility that the family attended Ayr’s Presbyterian church. It’s not clear just where they were living at the time the baby was born, and if he was in fact delivered in town, it have been because that’s where the doctor was. If details of that are lacking, Schmidt-Adeney does note that in 1924, when Buddy Maracle married, he gave his birthplace as Ayr. “I didn’t know anything about his side of the family,” Christine Pritchard was saying after the June 13 event. Her great-great grandfather was Wesley Richard Maracle, Albert Maracle’s elder brother, but in her 20 years of research into the family’s history, she’d never come across Buddy Maracle’s story. It was only after Schmidt-Adeney’s initial Ayr News article was published in March that someone from Six Nations alerted her to the connection. She came to Ayr with her aunt, Nancy Maracle, both of whom live in St. Catherines. Buddy Maracle and his family moved north at some point during his childhood. He first made his mark as a hockey player in Haileybury, playing for his high school, before going to North Bay in the early 1920s, where he worked as a riveter when he wasn’t skating the wing for the Trappers of the Northern Ontario Junior Hockey League. In the mid-1920s, he went to the Springfield Indians of the Can-Am League, where he played four years before taking his NHL turn in 1931. There’s more on that here. A couple of Rangers of later vintage who now live locally attended the June 13 ceremony. Dean Prentice, now 85, played the first 11 of his 22 NHL seasons in New York. In the 1970s, following his retirement from as an NHL left winger, he worked for the North Dumfries recreation department. Jay Wells, 59, got his start on the ice with Ayr Minor Hockey before serving 18 seasons as a defenceman with seven NHL teams, including the Los Angeles Kings, Buffalo Sabres, and the Rangers. 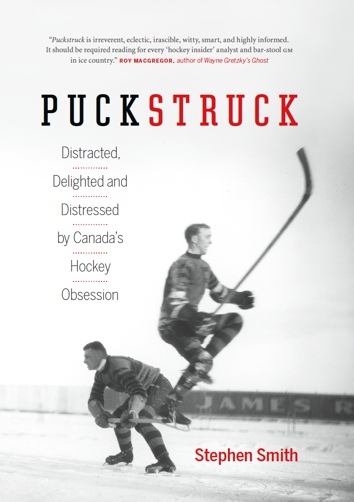 Neither Prentice nor Wells knew of Maracle when they were in the NHL. Terry General, the councillor from Six Nations, was emotional when he got up to accept one of the Ranger-blue sweaters from Irene Schmidt-Adeney. He spoke with pride of other hockey players from Six Nations who’ve worked their way to NHL ice, including Stan Jonathan, who made his name as an unforgiving left winger for the Boston Bruins in the 1970s, and defenceman Brandon Montour, who plays for Anaheim’s Ducks. Maracle’s 14: Showing their Ranger blues at the June 13 ceremony in Ayr, Ontario, are (left to right) Terry General, councillor from the Six Nations of the Grand River; Sue Foxton, mayor of the Township of North Dumfries; Irene Schmidt-Adeney.